A few weeks ago, we posted about an issue with Commercial Suicide bottles continuing to ferment beyond the projected finishing point, and becoming overcarbonated as a result. At the time, we did not feel that the issue warranted a full recall, but with extended cold storage, the bottle fermentation would cease and the excess CO2 that resulted from it would most likely get reabsorbed into the beer. Unfortunately, the fermentation has continued to a point where bottles may now be showing significant signs of leakage and may gush extensively upon opening. For this reason, we must ask that any retailer that still has Commercial Suicide on its shelves pull the product immediately. We would also advise any consumers who may be in possession of Commercial Suicide bottles to return them, either to the retailer from which they were purchased, or directly to the brewery. While we do not currently have any more Commercial Suicide to replace the overcarbonated batch, we are currently working on a Farmhouse version, which we hope to have ready sometime this spring. In the meantime, we will gladly replace any unopened bottles of Commercial Suicide that are returned to the brewery during our Saturday open hours with fresh bottles of one of our other beers of equal or higher retail value. Please accept our apology for this issue and for the inconvenience it has caused. Texas: Where beer is now beer! 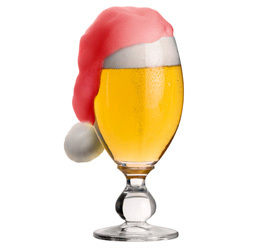 Christmas came early for those attempting change of the local beer laws when Judge Sam Sparks of the United States District Court For the Western District Of Texas handed down his summary judgement regarding the lawsuit filed by Authentic Beverages (with co-plaintiffs Jester King Craft Brewery and Zax, LLC) against the Texas Alcoholic Beverage Commission. The biggest win for local breweries is that they can now advertise where their products are available for purchase. Instead of attempting to work around the law by vaguely indicate locations without using the actual name of the store or bar, they will be able to directly list where their products are sold. Both local and out of state breweries will certainly appreciate the ruling that labels no longer have to contain the word "Beer" if its under 4% ABW or "Ale" if over 4% ABW (regardless of the actual style of the product). This often prevented out of state breweries from shipping their product into the state as they didn't want the extra burden of designing new labels just for the Texas market. It also occasionally caused existing beers to be pulled from the shelves or blocked from distribution when it was found their labels violated this ridiculous law. Unfortunately, the Judge stopped short of overturning the ban on breweries from being able to sell directly from the public, a freedom the wine industry has enjoyed for many years. Although they didn't get everything they were trying for, its great to see any change that helps the beer industry and brings further attention to the issues. Further information regarind the case and judgement is available at the Jester King Blog and Free Tail Brewing Blog. 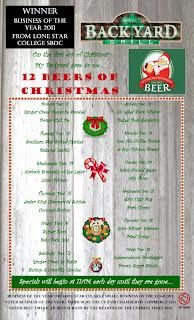 The Backyard Grill on Jones Road in Northwest Houston is celebrating the holidays with a 12 Beers of Christmas beer and food pairing. Starting today, they will be featuring a daily food and beer special starting with Ranger Creek's Mesquite Smoked Porter with a Chili Pie and ending with Independence Bootlegger Brown and Brown Sugar Sirloin on December 23rd. The daily special is available starting when they open at 11:00am until its gone. 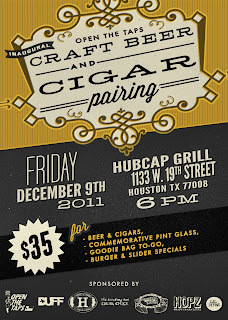 Open The Taps (a grassroots organization dedicated to changing Texas beer laws and regulations) is hosting a Cigar and Beer Pairing at Hubcap Grill on Friday, December 9th from 6pm ~ 9pm. For the price of $35 you get a goodie bag and a pint glass with a pint of Moylan's Ryan Sullivan's Imperial Stout and a Hight Cigar Primitivo cigar. The Hubcap Grill will also be offering burger and slider specials during the event. Teresa Merchant, The Smoking Hot Cigar Chick, and Jenny from the Heights Cigar Lounge will also be on hand to talk about the cigars. 100% of the ticket sales will go to help the Open The Taps organization. Only 20 tickets are available and you can RSVP to leslie@openthetaps.org. 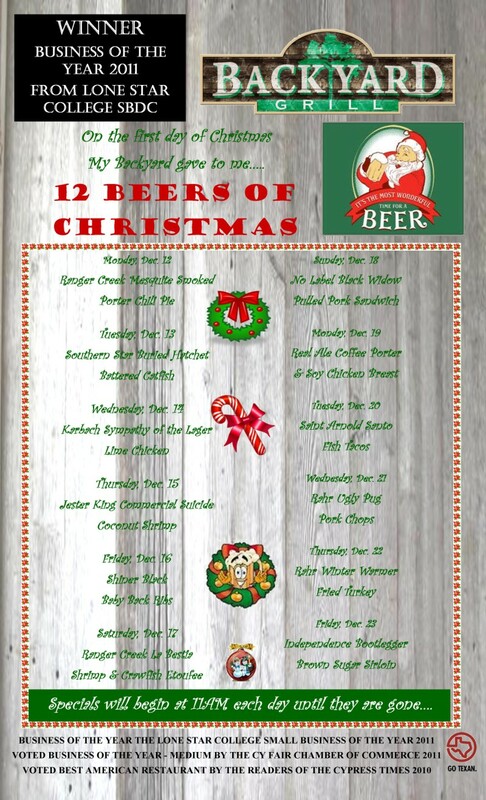 The Ginger Man is also hosting their annual Christmas Beer Tasting on Saturday, December 17th at 5pm. Various holiday beers will be paired with dishes prepared by Chef Angela Gaspard. Guest speakers will also be on hand to discuss the beers being served. If you're planning to attend, you must RSVP by calling (713-526-2770) or emailing (gm-houston@gingermanpub.com) the Ginger Man.